The administrators for Force India have accepted a bid for the team from a consortium led by Lawrence Stroll, billionaire father of Williams driver Lance Stroll. FRP Advisory confirms that all jobs at the Silverstone-based outfit have been saved, that all creditors will be paid in full and money will be available immediately as the team strives to defend its fourth-place in the team standings it has held for the last two seasons. "This outcome secures the future of the Force India team in Formula 1 and will allow our team of racers to compete to our full potential," said Otmar Szafnauer is a statement tonight. "I am delighted that we have the support of a consortium of investors who believe in us as a team and who see the considerable business potential that Force India has within F1 now and in the future. "At Force India, our expertise and commitment has meant that we have always punched above our weight and this new investment ensures that we have a bright future ahead of us," he added. "I also would like to thank Vijay, the Sahara Group and the Mol family for all of their support and taking the team as far as their circumstances would allow." "All creditors will be paid in full, all jobs will be preserved, and the team will have significant funding to invest in its future," added administrator Geoff Rowley of FRP Advisory. "Funding to support the team will be made available from today, and significantly more will be available once the company emerges from administration which we expect within the next two to three weeks." Stroll's fellow investors include his business partner Silas Chou, Canadian businessman Andre Desmarais, Jonathan Dudman of Monaco Sports and Management, fashion business leader John Idol, telecomms investor John McCaw Jr and financial expert Michael de Picciotto. 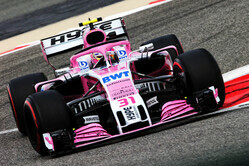 F1 will do "all in its power" to help Force India, promises Brawn. Renault, McLaren and Williams to block Force India deal? Wolff: Potential Force India buyers have "deep pockets"
"Well we will see what Lance can do now in a decent car. Hoping for the best. Would like to see more than two teams fighting at the front." Maybe dad bought driver seat to the son, so dad can enter F1 world? I googled those mentioned investors, it looks like they are in a business of making serious money. IF they succeed to make serious money from F1 team, you have to admit that would be a first :)"
"Great news, guess that means Lance will be in the car next season, Kubica to replace him at Williams? or will there money issues prvent that. Wonder which team Rich Energy will buy now?" "Very very happy for the team. I now wish the other teams would back the F off them regarding the name change / prize money issue. I really don't see who could disagree that A) they won their points on the same tracks everyone else was driving on, and B) Force India was always a really, really stupid name. Let's learn from our mistakes and get on with our lives. That said... "Canadian Mass Accelerators" is kinda growing on me. "Team Poutine" for short... "
"I agree with the other posters but you have to admit this is a first. Dad buys F1 team so son can have a drive." "This is good news and sure hope Liberty gets the financial business of the F1 teams sorted out soon so other teams won't fall by the wayside due to all the money going to the top.....sort of like the US tax system of the top 1% of the population getting huge tax cuts to be paid for by the rest of the rabble....oh, I mean the other 99%. Wondering if Stroll's partners have insisted on Stroll picking up all costs of the car his son will drive including all costs of repairing/replacing the ones Lance will wad up race after race?" "That's really great news, and I don't mind if Lance gets a drive out of it. That's hundreds of jobs saved, the jobs of people well-known for punching way above their weight, I'm really made up for all of them. I wouldn't be completely surprised if this created a favourable situation for Williams too, there's an interesting dynamic around all of this, of late... One of the best 'Silly Seasons' yet!" "This is indeed great news. But, a few concerns: Will Lance now be a FI driver? (and if so what will happen to the current drivers? ); Will the team now be named Force Canada (FC)? ; and What happens to Williams??? I'm not too preoccupied with Vijay's fate..."
"Let’s hope that will be the last we hear of FRP Advisory for a very long time." "At last, some heartwarming news from the world of F1 - good luck to them all: they deserve it, have earned it by performing and will work diligently, and quietly, for their new owners. to earn their just rewards. And Zebedee Zak's reaction. to this delivery rather than talk? Oh yes, he will have a plan !